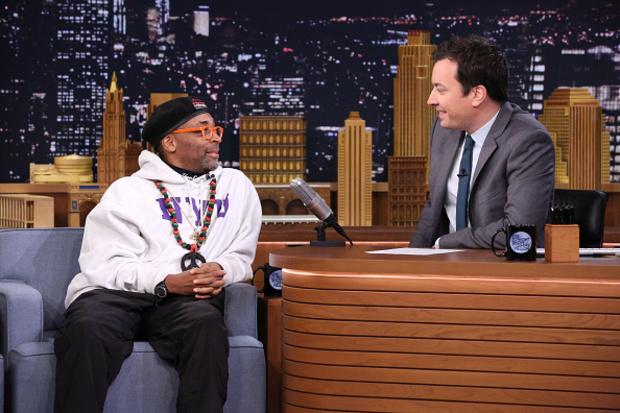 Spike Lee on the "The Tonight Show with Jimmy Fallon"
CHICAGO — Did you catch Spike Lee on "The Tonight Show with Jimmy Fallon" promoting his new film “Chi-Raq”? “The South Side of Chicago,” Lee interjected with wide eyes behind thick-rimmed orange glasses. He pointed his finger and nodded his head emphatically to stress the importance of what he had just said. And Fallon, pandering as if Mayor Rahm Emanuel was whispering in his ear, agreed. “The South Side of Chicago, we should say that specifically. Yeah,” Fallon said. I screamed some words at the TV screen that would get bleeped on "The Tonight Show" and my boss won’t let me print in this space that appropriately expressed my disgust and disappointment. Just when I finally thought we had put to bed all the silly controversy about the film’s title and Lee made it perfectly clear that he was using humor and satire to put a national spotlight on the serious issues contributing to the shooting epidemic in Chicago that also plagues poor black neighborhoods in other major cities in America, Mr. “Do The Right Thing” goes on national television and makes a point to stress that senseless shootings are only a problem in one part of Chicago. First of all, Chi-Raq — if that’s what you want to call the violent bizarro world in Chicago, home to gang shootouts and baby murderers — doesn’t have a specific geography you can single out as one avoidable side of town. Warring gangs and the heroin trade have turned the West Side into a war zone. And there are ridiculous gang conflicts in Rogers Park on the far North Side and in Uptown, a hop, skip and a jump from Wrigleyville, that start on social media and spill blood on the sidewalks. I thought Lee knew better. I guess I overestimated the guy. By singling out the South Side as Chi-Raq he symbolically lets people and corporations who turn a blind eye and allow gang violence to destroy poor minority communities off the hook. It’s bad enough that all the shooting and killing going on in black and brown parts of town have become violence voyeurism on the Chicago nightly news. And some high-rise-living rich folks in Streeterville, Gold Coast millionaires, Lincoln Park yuppies, even Wicker Park hipsters and clusters of city workers in Edison Park mistakenly feel they’re a safe distance from the madness. Lee’s implication that the problem is confined to desolate parts of town suggests the violence is a black-on-black issue that shouldn’t be of much concern to tourists, conventioneers, visiting dignitaries and Fortune 500 corporations with world headquarters in the Loop. Like a lot of people, Lee has pointed out publicly that there’s a "Tale of Two Cities" narrative playing out in Chicago. But his film, which I saw at a private media screening Friday, and his talking point on national TV fail to call for the unity our city needs to rebuild and strengthen neighborhoods decaying under the pressures of hopelessness, joblessness and fear. Lee deserves a lot of credit for filming "Chi-Raq" in Englewood. He hired local film crews, interviewed street-level interested parties and collaborated with activists. He also used Chicagoans as extras and actors, including Roseland activist Eric Wilkins, a former gang member left paralyzed by a bullet who plays a wheelchair-bound gangbanger with a heart of gold. What's more, Lee even included mothers who lost their children to senseless violence in his film. But when it came time for the star-studded “Chi-Raq” premiere, the South Side that was good enough for scenery in “Chi-Raq” just didn’t cut it for the big party. Lee didn’t insist on rolling out the red carpet at the Chatham 14 on 87th Street or the newly restored Harper Theater in Hyde Park or even hanging a giant screen at the cavernous House of Hope in Pullman. Instead, Lee decided on the stately Chicago Theatre on State Street in the heart of the Loop. Even Friday’s secret film screening for critics and reporters was at the River East AMC 21, in one of the wealthiest ZIP codes in Chicago. Some people might say it’s not fair to criticize Lee for celebrating “Chi-Raq” in the rich part of town, and maybe they’re right. But it’s also not fair when people in power — and Lee has plenty of star power — feel compelled to highlight certain neighborhoods as the embodiment of evil in Chicago but fail to show off the pockets of potential and opportunities for hope when it's time to celebrate. Don’t worry Spike, folks won’t complain too much. The people of Chi-Raq have never gotten to host the party. They don’t even know what they’re missing.